The Town Supervisor is elected to a four-year term of office and is a full time position. 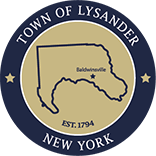 The Supervisor is responsible for the day-to-day operations of town government and is also the Chief Fiscal Officer for the Town of Lysander. The Supervisor’s responsibilities also include preparing and overseeing the town budget, personnel management, and presiding over the Town Board meetings. For more information on the Town Board and its meetings visit the Town Board's page.